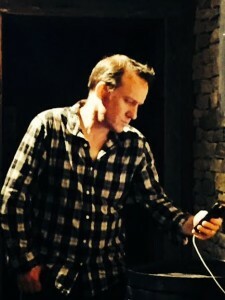 ‘Counting Apples’ is a one-act play, written by Michael Fitzpatrick. In the Spring of 2015, Michael entered the play into Manhattan Repertory Theatre’s short play festival, where it came up against over thirty other productions. It told the story of a young couple, their friend, and an incident which drove them together and tore them apart. It clinched its heat, and despite being up against strong opposition with TV, film and Broadway experience, went on to win the festival. Featuring stellar performances by real-life husband and wife actors John and Grainne Duddy, and Michael in his first appearance on stage, ‘Counting Apples’ (directed by Brona Crehan) had eight performances, all of which sold out. On behalf of the writer, director and cast, Michael would like to thank the many people who showed up on the nights (as well as those who were with us in spirit) and provided such wonderful encouragement, inspiration, love and support. To John, Grainne and Brona, who gave absolutely everything, ‘Counting Apples’ was an incredible experience, from the moment the first word was written, until the announcement that we’d won, and Michael hopes to work with these wonderful talents again (and again). Note: This is just selected passages and lines from the play, ‘Counting Apples’, not the production in its entirety. 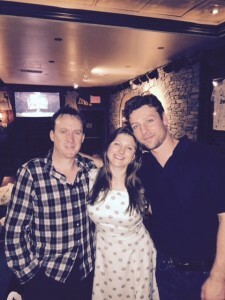 Michael Fitzpatrick (Terry), Grainne Duddy (Samantha) and John Duddy (Brian). 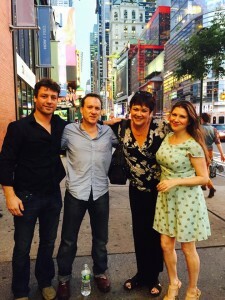 First Presented at Manhattan Repertory Theatre, West 42nd Street, New York City, June 16th 2015. 8 Performances until July 2nd. Opening and Closing Song: ‘Dilin O’Deamhas’ performed by Brona Crehan. 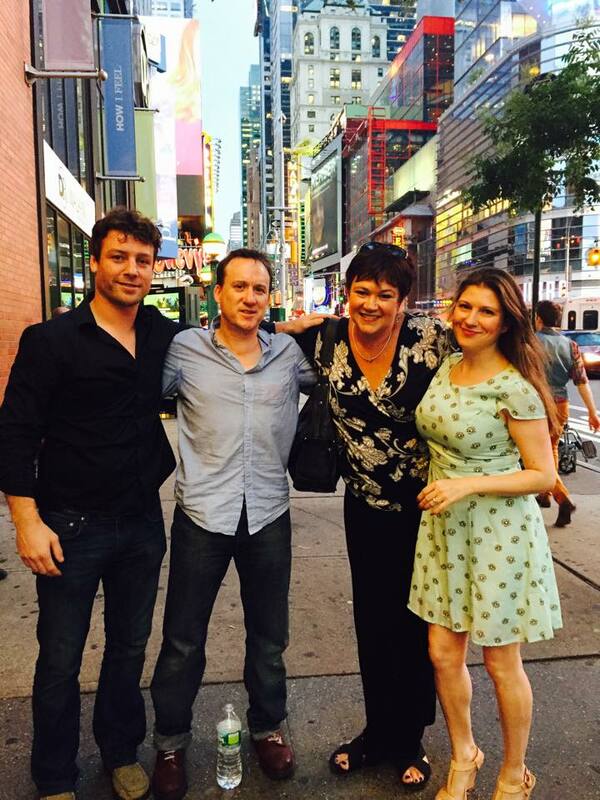 John Duddy, Michael Fitzpatrick, Brona Crehan (Director) and Grainne Duddy. Minimal stage set. Brian and Samantha sit next to one another, while on the other side of the stage, Terry sits alone. 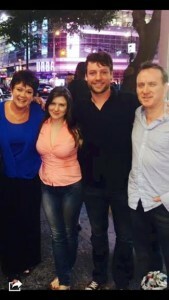 Neither side acknowledges the other, while Brian and Samantha are together, Terry is seemingly, in his own world. Lights up, 2 verses of Dilin O Deamhas in Irish. Samantha: Everyone thought I was nuts. Eleven different magazines I’d subscribed to. ‘Modern Bride’, ‘Irish Weddings’, ‘Bridal Fair’, ‘Weddings Today’, ‘American Bride’, and of course, all the celebrity wedding specials in Hello!, OK! And US Weekly magazine, it was crazy! But, I was so excited. I must’ve been a right pain in the arse!! I was probably that bubbly bride that people hated! Brian: I teased her afterwards, reading the receipts for the wedding day; Band – $900, Harpist – $400, Flowers – $750, Subscriptions to wedding/bridal magazines – $2,451.38. I’m exaggerating of course, not by much mind you! 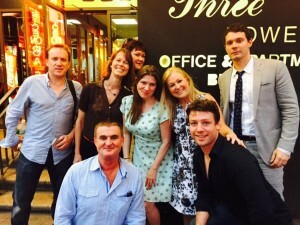 The cast with some of our good friends who supported us during the run. Terry: It doesn’t go away. That feeling. Fear, guilt, shame, whatever it is. Every morning when I’d wake, it would all be still there, right in front of me, staring, pointing fingers, shouting, you’re evil Terry. But I’m not evil. I used to be a good man. 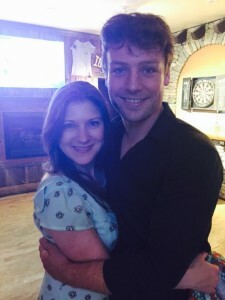 Grainne and John Duddy as Samantha and Brian. Samantha: Afterwards, Brian explained why he didn’t call me right away. He said that he wanted to give me ten more minutes of a normal life. He said he’d have left it longer, but that he was selfish and couldn’t suffer alone any longer. Those ten minutes, ignorant of all the tragedy, I wish I could have them back, but it’s not all I’d like to have back. Lights fade slowly, 2 verses of Dilin O Deamhas in English. ← The Boy on the Beach.